After a fall full of donating their time and energy to political campaigns, a few union carpenters went to Washington today to see the fruits of their hard work. NERCC Political Director Tom Flynn led a contingent that included Brothers Nicholas Pong, Tom Duncanson and Rob Donovan of Carpenters Local 424 as well as Brothers Mike Norton of Carpenters Local 40 and Kevin Barrett of Carpenters Local 33. The members all worked on the campaign of former District Attorney Bill Keating, who was elected to replace retiring Congressman Bill Delahunt in the 10th Massachusetts Congressional District. 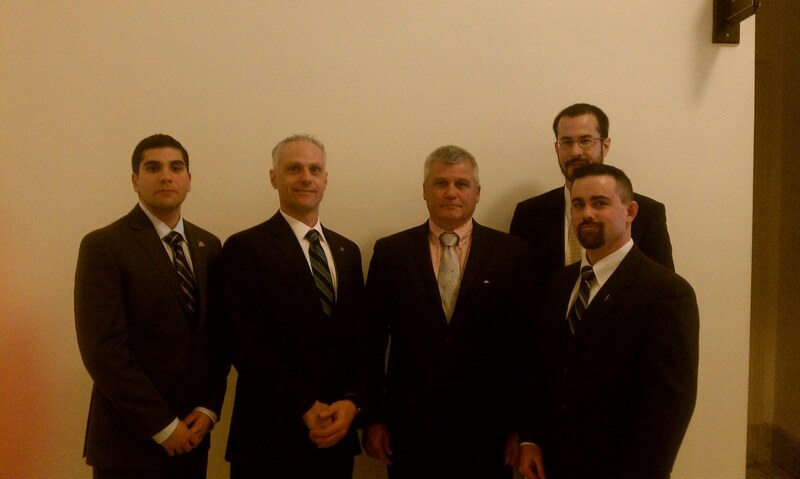 The members attended Keating's swearing in, then stopped by his new office in the Capitol before heading over to visit the headquarters of the United Brotherhood of Carpenters. Their final stop of the day before flying home was a reception being held in honor of Congressman Keating. Pictured below, from left to right are: Brothers Donovan, Duncanson, Norton, Pong, and Barrett.